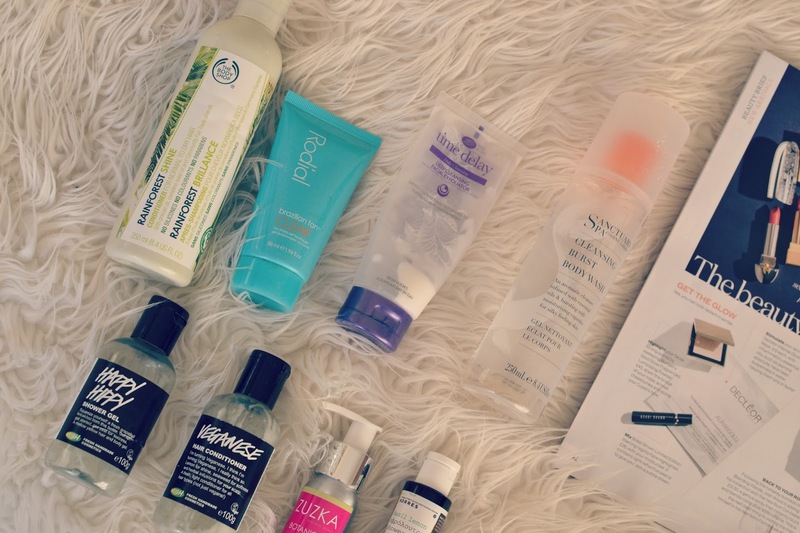 My last empties post was back at the beginning of October and that was quite product specific, I talked about a few Botanics products that I'd really enjoyed using. Since, I've not actually bought that many new products, but instead been working through my bathroom cabinet! I thought it would be nice to round up some of the things I've been using and also to review a couple of the ones I've liked or not liked so much. I did make a purchase from The Body Shop and I picked up the Rainforest Shine shampoo and conditioner. I don't know if I overuse conditioner because my hair is so long, but I've probably got half a bottle of the shampoo left (in the same size) but the conditioner is all gone! It was ok; I didn't found it as nourishing as I had hoped it would be, and it wasn't great at detangling either. I did, however, really like the scent, but I wouldn't repurchase. I also tried out the Lush Veganese conditioner (hauled here) and I didn't get on with this, either. I never seem to have much luck with Lush conditioners; the shampoos are always amazing but I just don't think the conditioners work for my hair. For the price, I wouldn't re-buy it. A random item is this Rodial clear Brazillian tan, which I'd forgotten I had but is actually probably the only self tan I've ever used that doesn't make me look completely orange. I tend to steer clear of fake tan altogether, and I think I got this in a goody bag or a subscription box or something, so I thought I'd try it. Although it was good, it's heinously expensive so I wouldn't bother to repurchase this. Several shower gels have made it into the empty box over the last few weeks and my favourite has got to be this Sanctuary Spa cleansing burst body wash. The light gel has bath beads in it which melt when lathered and soften the skin. The smell of this is unbelievable; fresh and light with a slight spiciness. I actually took a travel sized version of this to Barcelona when I went to Primavera Sound festival earlier in the year, so the scent takes me straight back. I don't think this is very cheap, especially for a shower gel, but my mum gave me a box of Sanctuary products and this was included. I will definitely look in to buying it again; maybe with my Boots points for a treat! I have also been using the Korres Basil Lemon shower gel (which I talked about here) and this was also amazing. A really fresh, energising scent that reminded me of summer and beaches. Again, I would re-buy the full sized version of this if I saw it on offer! The same could also be said for the 'Happy Hippy' shower gel from Lush; perhaps not my favourite scent, but a really nice every day body wash to use. For facial skincare, I talked more in depth about the Zuzka products in this post, and I really enjoyed using this light, rose-scented cleanser. The smell was just lovely and it was very gentle on the skin, whilst still removing all makeup and grime. Likewise, the Time Delay exfoliating cleanser was also a good dirt remover, the smell of this one wasn't so nice, but for a weekly treat it definitely helped freshen the skin and leave it feeling soft, without being too abrasive. I am always on the lookout for new skincare tips and who better to advise you than your girlfriends? 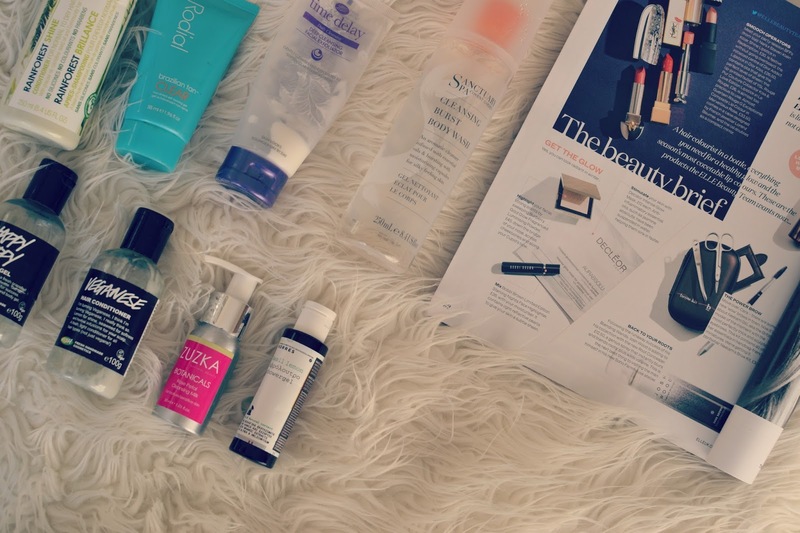 My lovely friend Stef sent me a picture of a couple of products that she'd used up and really recommended. Firstly, Bioderma micella water, which I've heard a lot of good things about. I've got a Garnier version of this, but I've always wanted to try the original, which is great for removing makeup and cleansing the skin. Secondly, she also recommended the Roger & Gallet Lait Sorbet body lotion. I've tried the Roger & Gallet Fleur des Figuier range before and I absolutely loved it, so I'm definitely going to try to look for this one and give it a go. Thanks Stef!